When it comes to the maintenance of Allocations in the Business Process or System privileges, it will take a big effort to perform it for each “User unit”. 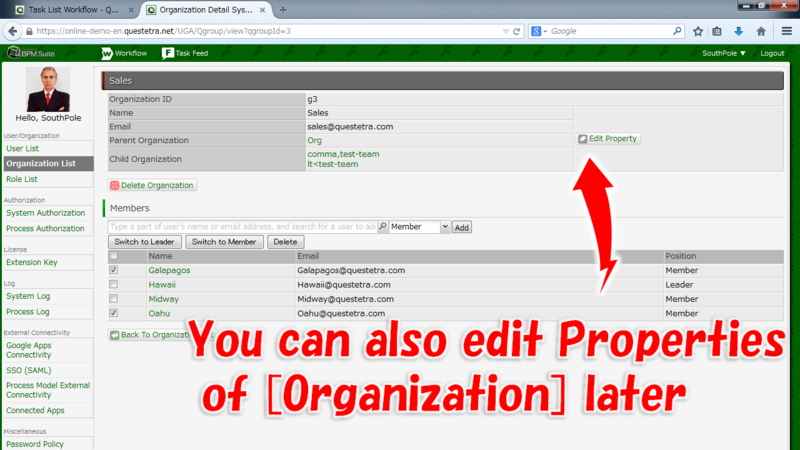 In Questetra, you can configure them by "Group Unit" using the Grouping feature called [Organization] or [Role]. [Organization] is represented as a Tree structure, such as "Company - General Affairs Department - Human Resources Department", so you can use its hierarchical structure to manage the User affiliations. Grant, e.g. Administrator Privileges to the Users who belong to 'IT Department'. Grant, e.g. [Data Viewer Authorization] to the Users who belong 'Sales Headquarters' and its sub-organization. Define Business Rules, e.g. request reviewing to anyone in the Parent Organization. Granted privileges and authorizations will be revoked at the time the User is removed from the [Organization]. Name the Organization which to contain all the Users who log in to Questetra. 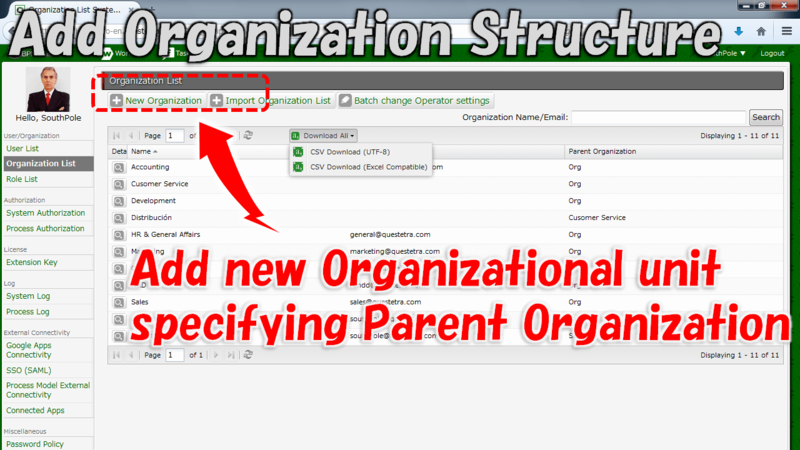 Make a grouping for all the Users to be assigned, then add as [Organization]. 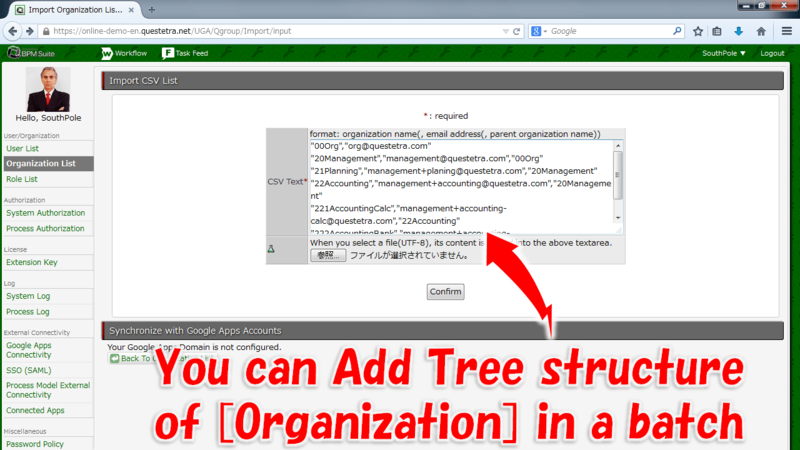 In case using within in-house members, name the root organization, e.g. "Company" or "example.com". In case using among multiple companies, set the representation, e.g. "X Project" or "All Traders". e.g. Root Organization:"00. Company", suborganization:"10. Officers", "20. Management Dept. ", "30. Sales Dept." Subdivide to the Organizational unit that is used in the definition of Allocation rules or setting of Data Viewing Authorization. You can also add in batch with CSV data. This setting enables to define Business Processes, e.g. "Approval by the belonging Organization Leader". This setting enables to define Business Processes, e.g. "Auto-sending Emails to all the members of an Organization". How do I allocate a Step of Approval to the superior of the applicant? Can I Register Information of Accounts in Batch?